Love the pencil "treat" Haiku! 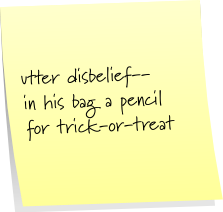 Good one, D. I've had one trick or treater here in my 22 years in Goffstown -- a woman down the street and her little kid. I had no candy and not much coin. I offered to write the kid a check!